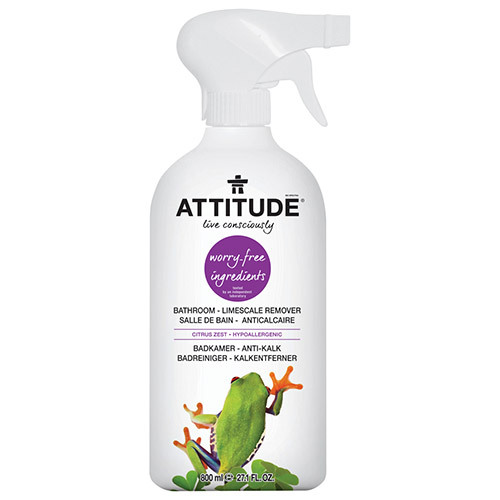 Clean your “ceramic living room” with ATTITUDE’s Bathroom Cleaner. Designed to efficiently eliminate soap scum and grime from tiles, vinyl curtains, shower doors and toilet bowls, it helps you keep key areas spotless using worry-free, plant- and mineral-based hypoallergenic materials. Shake well before use. Spray and rinse. Specially designed to eliminate soap scum and grime from ceramic tiles, bathtubs, shower curtains and doors, and toilet bowls. It is recommended to test on an unnoticeable area and to avoid irritants or exacerbating factors (such as harsh detergents, solvents or acidic foods). 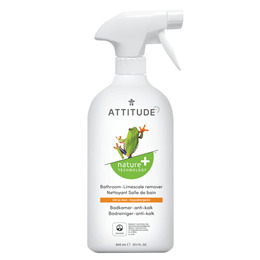 Below are reviews of ATTITUDE Bathroom Limescale Remover Citrus Zest - 800ml by bodykind customers. If you have tried this product we'd love to hear what you think so please leave a review. Effective cleaner, with clean smell. No skin reaction which is great.